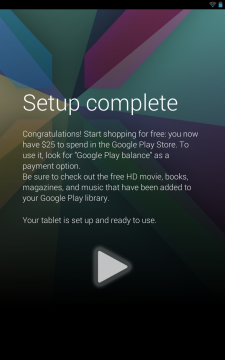 The Nexus 7 has some free great content for those who buy it now: get $25 credit to spend on Google Play, as well as some great free content, including your own copy of Transformers: Dark of the Moon. Sadly, this is only available in the United States. Also, access to Google Books, Magazines, Movies and TV are also restricted. If you wish to use Google Play Music, read more on our related post. It is recommended that you wipe your Nexus 7 data and start from scratch. However, I deleted my Google Account on my Nexus and started at Step 5 and it worked. So try my method first if you already have your N7 set up. When you get to the screen to enter Google account skip it. Uncheck all the check-boxes in next screens. Now when you got to the home screen, go to settings. Set up your wireless. Under Wireless and Networks click more. Click on VPN, Add VPN. Now the Nexus 7 will ask you to define security (Pattern,Password,PIN), Define whatever you want. Click Add VPN again, and enter this definitions: Name: SuperFreeVPN, Server address: superfreevpn.com and click save. Click Connect. If connected successfully you will see a key icon in the notifications. (If you skip Step 1 to 3, now is the time to delete your current Google account). Go to Settings, under Accounts click Add Account and choose Google. Enter your username and password, if everything is OK you will get to screen that will ask you to enter credit card to Google wallet to receive $25 credit. You can use a non-US credit card. I did mine with a local credit card but YOU must enter a US address. I suggest using your VPOST address? With VPN avtivated, you can download Google Books, Google Magazines, Google Movies and TV. To activate them, go to add widget and choose “Play – My Library” Widget and click on it to activate the app. VPN needs to be connected. You can download the books, magazines and even Transformers and preload them offline. Only Google Movies and TV require a constant VPN connection. Do note that your credit card details and google account details will be transferred across the VPN. So far, superfreevpn has been considered safe, but if you wish to add a layer of security, you can change your google password first and use a debit card with limited funds. P.S. Also, if you are going to root your Nexus 7, please do it first as it will wipe the device. Please refer to the Root Nexus 7 post on GadgetReactor. With root and Titanium Backup, you can defrost all the Google Play Apps and Google Wallet. 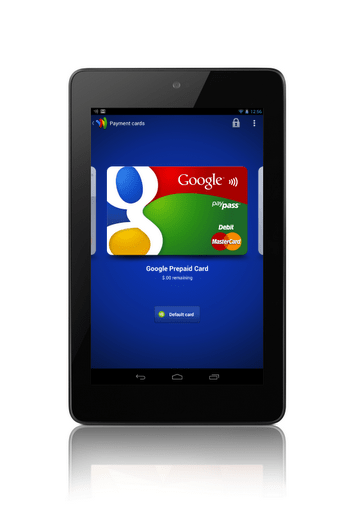 Why Google Wallet? Because that gives you a prepaid US$10 Mastercard Paypass card. Update: It does work in Singapore at the Paypass Terminal. Verified locations are at Cold Storage and at Burger King and as Tedfox has rightly pointed out, just delete and re-activate your Google Account over VPN. However, the $10 credit offer is over since 17 September 2012.
delete and re-add Google Account. Its not very consistent so try and let me know if it works for you. I believe you don’t have to disable all location services.